We are the R.U.R. team from Grammar School in Jeseník and Rainbow Leisure Centre Jeseník team consisting of girls and boys girls and boys aged 13 to 18 years. We are a group of young people who like robots, technical projects and things like that. We mainly build robots from LEGO with which we compete in lots of competitions, for example in FIRST LEGO League, in which we’ve been successfully participated for many years. Four times we also took a part on RobotChallenge, which is the most prestigious robot competition in Europe. However, you can see us in many other competitions and events in the Czech Republic or even abroad. If you have any questions or would like to know something more about us, please, just CONTACTS us by using a form in contacts section or on our Facebook page. Our history started in 2008. The first name of the team was “Wormíci”. 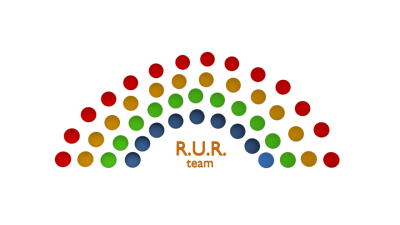 After a year the team has changed the name to “Rainbow Universal Robots”, in short form “R.U.R.” This name symbolizes the connection with the first use of the word “robot” in the world in a theatre play “R.U.R.” written by Karel Čapek, and also as an esteem and gratitude to Rainbow Leisure Centre Jeseník (Středisko volného času Duha Jeseník) which was at the origin of this team. Current team is based on these origins (gradual renewal of the members) and adds more successes. During our activities we’ve set up cooperation with institutions like Coordination Council of the Minister of Transport for Space Activities, ITS Niedersachsen and hypermarket Globus.